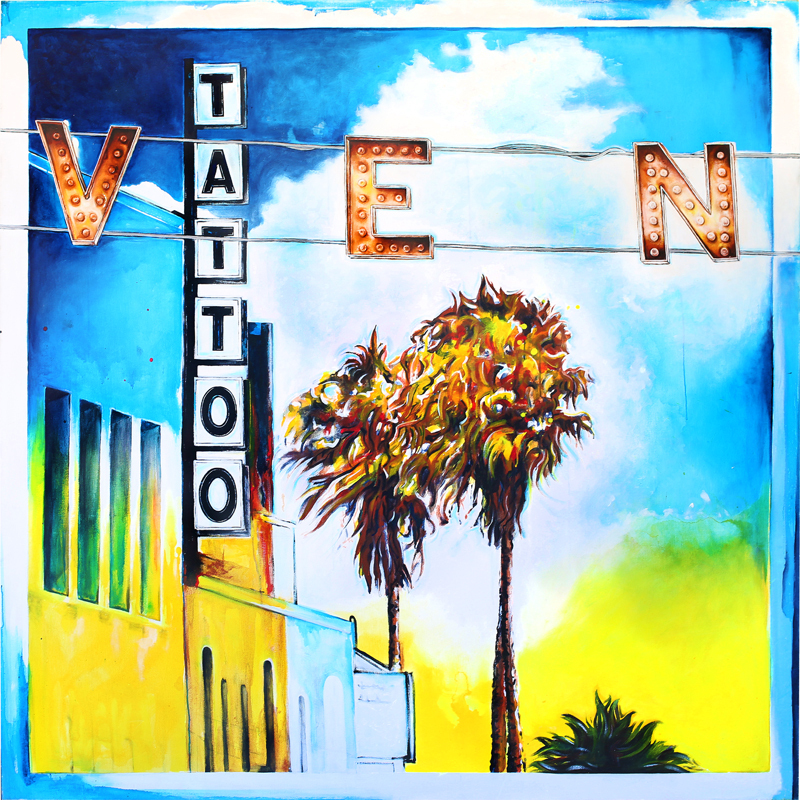 “Venice & Windward” // Painted by Venice Beach artist Patrick Marston. Painted with oil and acrylic on canvas. The Venice At Crawl is switching things up a bit for 2018. Rather than hosted events throughout the neighborhood, each quarterly crawl will be held in a concentrated pocket of Venice. The first event takes place Thursday, March 15th from Windward Avenue to the beach, 6 to 10 p.m.
Start 2017 with a brisk dip into the Pacific at the Venice Breakwater. Registration starts at 11 a.m. Everyone in the water by noon. Two swimmers who brave the chilly surf and mark the quickest 400-yard lap around a buoy with be crowned as penguin royalty. Dare to take home the victory and bragging rights or opt for the 100-yard "fun" course. Everyone who finishes will be rewarded with a certificate, snacks and, best of all, a hot drink. Get your last-minute holiday gift shopping wrapped up at Artists & Fleas on Saturday December 24th from 11am to 3 pm. Art, jewelry, clothing and home goods (both vintage and newly handmade) are sold by local makers and vendors on the lawn of Abbot Kinney's Westminster elementary school. The event is kid and pet friendly. Check out who's vending this weekend at Artists & Fleas. It's the largest grower-only certified farmers' market in Southern California and a favorite among local chefs. Visit the Santa Monica Farmers' Market every Wednesday from 8:30 a.m. to 1:30 p.m. in Downtown Santa Monica, located at Arizona Ave and 2nd St.
Plus, tequila spirits sponsored by Calavera. "Where the Palm Trees Glisten" will be the theme at the 2016 Venice Canals Holiday Boat Parade and the Best Dressed Homes and Bridges Contest. Gondolas and crafty wind-powered vessels are all welcome to participate in the annual parade set for Sunday, December 11. Boats will line up at 3:30 p.m. at the corner of Eastern and Carroll Canals with the parade to start at 4 p.m. Winners of the Best Dressed Homes and Bridges contest, which will be judged on Saturday December 10th, will be announced at the start of the boat parade. Prizes will also be awarded for best boat decorations and originality. More details and parade route here! The merriest night of the year in Santa Monica - the 8th Annual SANTA Monica Pub Crawl - returns Saturday December 10 at 5 p.m., presented by Grubhub! Join thousands of crawlers spreading merry good cheer throughout the city and raising money for those in need through the Westside Food Bank. Choose between the Pier, Promenade, Main St. & Wilshire routes, get your tickets, and celebrate the holidays at the SANTA Monica Pub Crawl. Tickets are $20 in advance and $25 day of for the SMPC official wristband, which gives you access to food and drink specials at all of the participating bars on your route. All participants are encouraged to dress in Santa or holiday attire, either individually or as a team. Don’t miss the official SMPC after party at Wokcano after you’ve visited all the bars on your route. Tickets at http://santamonicapubcrawl2016.eventbrite.com. Join local floral designer Venice Wildflower for a special wreath-making workshop at Artists & Fleas on Saturday, December 10th. An array of foliage, flowers and plants will be on hand to create your own beautiful, unique wreath, ready to be hung at home or gifted as soon as you leave the market. But these blooms aren't your regular mistletoe — Venice Wildflower founder Mikette Miller loves texture, color, pattern, and scent, and her works are creative concepts brought to fruition at a grand scale. Venice Wildflower is inspired by the grace and power manifested in the wildflower growing free. Mikette will teach you her best tricks to make your wreath a true piece of art ready to take home or to your next holiday party, and will give you tips to make them last. Book tickets for Venice's Artists & Fleas event on December 10 ($40), or stop by the market to watch these beautiful creations brought to life. The 54th annual holiday boat parade in Marina del Rey begins with a snow day in Burton Chace Park. From noon until 6 p.m., kids can play in the snow, sled, get their faces painted, and then a fireworks show signals the start of the two-hour parade. Fisherman’s Village and nearby bars and restaurants offer the best spots to see the decked out boats illuminate the channels. One of the Westside's longest running Christmas traditions and fundraisers, the 39th annual Santa Monica-Venice Christmas Run returns to the Boardwalk on Saturday, December 10. The Christmas Run ends at the Venice Pavilion (on Windward at the Venice Sign), and here you'll also find the 1k Kids Fun Run course, along with music and entertainment. There may be sunshine and palm trees, but a slice of Venice will become a winter wonderland with real snow and a visit from Santa on Saturday, December 4 at the annual Abbot Kinney Stroll. Peruse in-store events as Christmas carolers harmonize up and down the block. In addition to sledding, there's plenty of activities for the little ones too, including face painting and crafts. You can also bring a toy to the annual Venice Sign Holiday Lighting party on December 2. There will be a collection booth set up. Or, wait until the two-day toy drive extravaganza on Muscle Beach, December 3 and 4, from 10 a.m. to 3 p.m. Santa and his entourage of lovely lady elves are due to ride in on an LAPD open sleigh on Sunday at 1 p.m. The Venice sign will be made merry and bright at the 5th annual holiday lighting ceremony and block party. Festivities begin at 6 p.m. at Windward and Pacific, and as in years past, a surprise guest will do the honors of flipping the switch at 8 p.m.
For those who'd like to participate, there will also be a toy collection happening for the 10th Annual Muscle Beach Toy Drive (in conjunction with the LAPD Pacific Division & Pacific Area Boosters) and the Great Venice Toy Drive. On the first Friday of every month, Venice locals and visitors alike dine at food trucks along the stretch of Abbot Kinney boulevard, while shops, restaurants and bars will often feature discounts or special events for the evening as well. Calling all Mo Bros and Mo Sistas—Stouts N Stashes returns to Venice on Saturday, November 19 to celebrate the month of Movember. Starting November 1st, men around the world will grow a mustache to raise funds and awareness for charities of their choice focused on men's health. Culminating the effort here in Venice will be the fourth annual Stouts N Staches fest, a beachside bar crawl leading to live music, local vendors and fresh shaves at the Hotel Erwin. A portion of proceeds from Stouts N Staches benefits the Venice Family Clinic. General admission tickets available now are $12 each. Day-of tickets are $15 at the door. Open now through January 17, this 8,000-square-foot ice rink gives Westsiders an excuse to break out their winter wear. Located at 5th Street and Arizona, it's a short walk from Third Street Promenade, and a good way to chill out after a day of holiday shopping. Admission is $15, including skate rentals. Electric Ghoul-Aid Acid Test IV + Menotti's After Dark + Mahalo(ween) special. Insects Vs. Robots, live bands, DJs, costumes, lights, specialty drinks and dancing. Doors open at 9 p.m.
Main Street's favorite haunts are hosting a two-night bar crawl starting at Circle Bar. The first crawl takes place Saturday from 2 p.m. to 10 p.m., and the next is on Halloween night from 5 p.m. to 10 p.m. Drink specials include $4 draft beers, half-off well drinks and $5 shots. Single tickets are $10 each, and there's a five-person group discount for $40. Get tickets here. Check in at Circle Bar and pick up a map of participating bars and wristband. Bring the kids for Halloween pre-gaming at the Kids' Canalloween party at Linnie Park. Hosted by the Venice Canals Association, the annual event will have games, face painting, and of course, treats to start their stash before heading out to trick-or-treat. It's a Howloween party for the fur babies. Join the pup parade and walk the red carpet in costume for treats and prizes on Sunday October 30th at 23rd Avenue and the Venice Bike Path. The fun starts at 4 p.m., and the costume contest and parade starts at 5 p.m. Treats provided by Hungry Dawgz of Dogtown. Plus, more treats and photos courtesy of Bruno's Pet Boutique. Acoustic music by Jeremy Parker. Bloody Mary, Bloody Mary. Get your bloodys at Del Frisco's Halloween brunch this Sunday, October 30th. The Petersen Automotive Museum is partnering Venice moto shop Deus Ex Machina for a special motorcycle edition of the Breakfast Club Cruise-In. Meet at Deus at 8 a.m. and cruise over together. Enjoy strolling through rows of classic, custom, exotic cars, trucks motorcycles and more. Complimentary parking, coffee & bagels are provided to all that attend. Steps away from the Venice Beach Boardwalk, Larry's Venice is hosting a Halloween party with drink specials, costume contests and prizes. No cover at the door. And, it all benefits Walk4Alz, a community volunteer organization fighting against Alzheimer's and other dementia disease. The Doors tribute band Peace Frog is playing a Halloween show at Danny's Venice. The 19th Annual James' Beach/Canal Club Halloween Party. There will be a $500 gift card costume prize. To enter, upload your costume photos from the James' Beach/Canal Club Party and tag James' Beach/Canal Club on Instagram or Facebook along with the hashtag #jbcchalloween. The winner will be chosen Monday, October 31st. There will be two live DJ's, drink specials as well as a photo BOOth provided by Venice Paparazzi. Cruise the marina aboard a luxury yacht as the Entertainer transforms into the Haunted Blood Vessel for Halloween. Three decks, two DJs and 350 party people are what you can expect. Costumes encouraged but not required. Tickets start at $55. More information here.